A beautiful lined and insulated shop built by Greiner Buildings. Servicing Iowa and Illinois. Greiner Buildings has been proudly serving Eastern Iowa and Western Illinois for the past 30 years. We construct custom pole buildings for all different industries. Our focus is on building high-quality structures to your satisfaction. There are a lot of benefits to purchasing a pole building from Greiner Buildings for your residential or commercial building needs. Our buildings are flexible, environmentally-friendly – 100% recyclable, durable, easy to assemble, long-lasting, and energy efficient. In addition, our buildings are cost-effective, providing you with an affordable and reliable custom building. Residential: Greiner Buildings’ unique creation is the combination of the shop and home, the SHOME®, a stylish, comfortable, and functional work and living space. Commercial Condos: If you are in need of office space or workspace, we offer energy and space efficient buildings to fit your individual needs. Lined & Insulated Shops: Farmers, mechanics, and others need a space that is strong, well-insulated, and large enough to complete their work safely. Storage: Storage space that protects from the elements and stands the test of time – Greiner can provide that space. 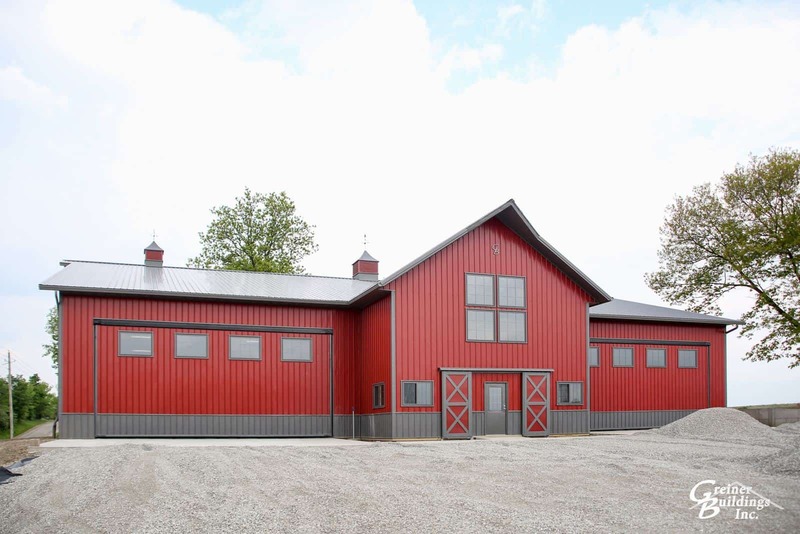 Livestock Barns: We offer a variety of customizations in terms of stalls, ventilation systems, and doors that are perfect for livestock and cattle barns. Wedding Barns: We design beautiful, high-quality buildings for various events like weddings, parties, to your custom specifications. These are just a few of the different industries that we serve with custom steel pole buildings. Contact us today to get a free quote for your next post-frame building.